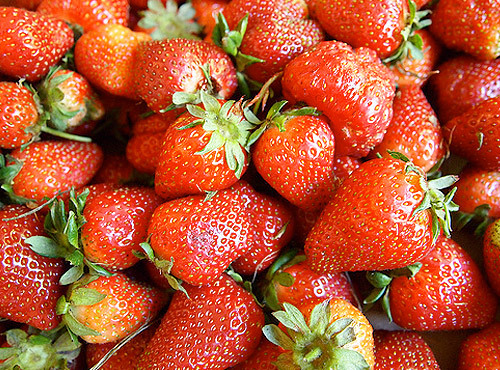 Red, ripe strawberries are superb sliced and piled into a hot, buttered shortcake and eaten with thick cream. Preheat oven to 200°C. Mix flour, salt and ⅓ cup sugar in a large basin. Rub 80 g butter into flour mixture until it resembles breadcrumbs. Mix egg yolks lightly with milk. Make a well in dry ingredients and add liquid. Work together quickly to make a soft dough. Turn onto a baking tray and form into a round 3 cm thick x 15 cm diameter. Bake for 15 minutes until golden. Allow to cool a little. Mix berries with a little sugar. Split shortcake and while still warm spread base with butter. Pile on sliced berries, lightly put on lid, dust with icing sugar and cut into wedges. Pass thick cream separately. Individual shortcakes Make dough as instructed, then dip a scone cutter in flour and cut without twisting the cutter. Put close together on baking tray for soft edges, or apart for crisp edges. Bake for 10–15 minutes, then split and fill as for a large cake.